Would you spin a sign to sell a listing? Denise and Troy Schroder would. In fact, they used “human signage” to direct traffic to an open house. They were the fourth agent or agent group to try to sell this home, they said, and by the end of the event, the signage won them eight new leads. Marketing as opportunity strikes is how this husband-and-wife team keeps its business thriving. The duo was recently recognized as Innovators of the Year in the Real Estate industry in Oklahoma City for their creative use of photography and successful marketing strategies. Their enthusiasm for their craft is infectious. Starting their real estate career in 2012, their creativity is paying off for a team that is newer to the scene. The Schroders were also recently featured on “House Hunters” in a special episode where they helped a close friend and single dad find his dream home. Where do you find your inspiration for your costumes and slogans for your photos? “I have always been very creative,” Denise Shroder said. “We used to own a photography company, so in my eyes, everything is a ‘photo op. 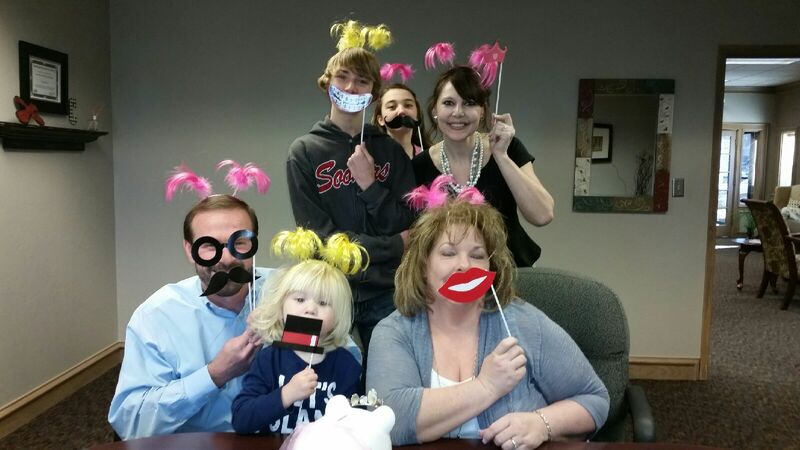 '” The Schroders even incorporate fun photo props into their clients’ closing celebration photos. What was it like to be on “House Hunters”? After the show, did you change the way you market yourselves? What is your favorite way to help market a home that is difficult to sell? “We focus on the positives, love video marketing — we have even gone so far as to do human advertising to drive people into the neighborhood,” Denise said. “In one instance, we were the fourth round of agents trying to sell this home. “We did human advertising at the corner and got multiple offers stemming from the open house. I was not just standing on the corner; I was dressed up with big directional signage and full mask on. We also door-knock and get belly-button-to-belly-button with the neighbors, as well as nearby subdivisions that may want to move up into where we are selling. We love neighborhood twilight tastings and open houses. “Meeting residents in the neighborhood helps give us insight into why they love where they live and gives them an opportunity to ‘pick their neighbors.’ ​We don’t ‘plant and pray’ when we stake the sign. We ‘prospect and penetrate’ and leverage the listings to get them sold fast and for top dollar. Being fairly new to the game of selling and then with you having great success, what has been your most challenging growing pain? “Growing so quickly has been a blessing and such a curse,” Denise said. “I love to ensure every aspect of our clients’ customer service experience is five-star — red-carpet treatment is part of our branding. Giving up control to a transactional coordinator has been difficult but frees us up to network and be out doing what we love — selling. What advice do you have to give agents looking to step up their marketing game? “We spoil our top 50 clients; we do regular pop-bys and set notification alerts when our ‘Champion’ clients post on social media, so we can engage and be in tune with what is going on in their world to not miss interactions, etc.,” Denise said. “We also have a solid database CRM set up that we add to and faithfully feed. I love writing handwritten cards, which seems to be a lost art, so people truly appreciate them. We, or I rather, do singing telegrams to our clients. Sometimes, if time allows, I go in person, but if not, I send or post on social media. “This leaves a lasting impression, and the clients look forward to next year’s birthday ‘singagram.’ There are 3,900 agents in the Oklahoma City metro area. We wanted to be top of mind — different. I believe we are doing things no one else is doing. ​Staying in touch with our clients in a very genuine, personal fun way has been very effective for us. The Schroders are kicking it up in OKC, and their future looks bright. For them, marketing is not just yielding transactions, they are expanding their network in their community. Connect with the Schroders online here, and stay tuned for their next “House Hunters” episode.